Rochester Marriott Airport Hotel showcases luxury accommodations and amenities including: 210 stunning guest rooms, complimentary high-speed Internet access. Recharge in our fitness facility or relax in our indoor pool, whirlpool spa. For exceptional dining, visit Images featuring distinctive American cuisine. Unwind in Images Lounge with comfortable, contemporary decor and a casual menu. Our hotel offers complimentary on-site parking and airport shuttle. With 5,600 square feet of event space, the Rochester Marriott Airport Hotel appeals to event planners with state of the art meeting facilities and entices brides-to-be with a distinctive ballroom. 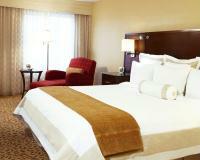 Experience extraordinary service and true hospitality at The Rochester Marriott Airport Hotel.